Pour 1/4 cup melted butter into a 9 x 13 baking dish. Add 5 cups of frozen Mr. Dell's Hash Browns. Mix soup, sour cream, milk and green onions in separate bowl. Pour half of the mixture over hash browns. Sprinkle 1 cup grated cheese on top. 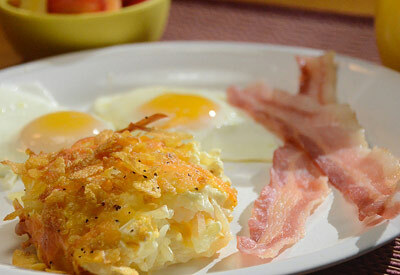 Add remainder of hash browns and mixture on top. Sprinkle on remaining cheese, then cover with crushed corn flakes. Drizzle 2 tablespoons melted butter on top.